Saline Valley has been the home to a wide variety of communities both recently and over the span of centuries. Many unique and special communities have been born of this place and stood the test of time. The nature of these communities has changed over the course of many decades. With the help of friends who have asked that I tell it “how it was,” I am hoping to give some historic perspective to the earlier communities. Saline Valley is a valley of silence. The silence has a power and presence that cannot be disturbed by sound. The silence is akin to vibration. It is profound, and it has always had a deep and somewhat subliminal effect on people who reach a point of quiet in themselves to be able to listen and hear the silence. Yes, one can hear silence in Saline Valley. It is a silence and a presence borne of emptiness and expanse. It is, in a simple term, energy. It touches people. It is, in a simple term, akin to love. I can stand on a piece of high ground and look out over the expanse and hear the sound of silence. I can hear the wind gather up from a distant reach; I can hear the wind coming; the sound of the wind does not touch the silence that surrounds me. From the emptiness, I am filled. This remarkable quality of silence and vibration and expanse has drawn many souls to its secret. Those who have been touched find a deep common ground, and communities are born. Even after people withdraw from the Valley, the spirit and the communities born within its horizons persevere and persist. Saline Valley has qualities that many people have recognized as existing nowhere else. 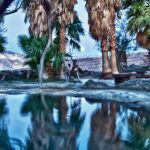 Many communities and cultures have in some measure profited from their relationship to Saline Valley. Earliest were nomadic tribes of indigenous people (likely ancestors of the Paiute) who seasonally wandered through the valley in search of opportunity. I have observed many signs of habitation around the Upper Warm Springs, including metates and obsidian chips. (I would speculate the obsidian came from the area of Glass Mountain in Mono County.) Travertine terracing in the vicinity of Upper Warm Springs suggests there were times in the past when much more water issued from that spring than present day. Hunting blinds on the black hill (volcanic basalt) to the north and west of Palm Springs suggests to me that these people camped at Upper Warm Springs and waited behind blinds further down valley for sheep to come take advantage of the water source, wherein they would become prey to the hunters. 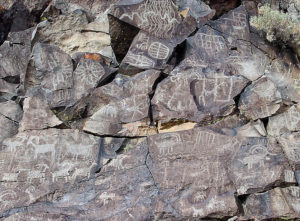 Evidence of big horn sheep is abundant in petroglyphs found throughout the Saline area. I once observed big horn sheep tracks in the large wash below Peace Mountain shortly after government agencies thinned out the feral burro population, which has otherwise displaced native species of fauna. Mid-1800’s the U.S. Army and cavalry operated out of Fort Independence (at the time, Camp Independence) and must have made some forays into the valley. I was told by Lucky Rich (1980) that a camel femur had been found in the sand dunes of the valley floor. Camels were native to North America in the Miocene epoch, which is when the valley (basin) presumably started to form. It is unlikely however that this single bone had anything to do with those times of the distant past, and more likely was a relic from the cavalry’s failed experiment of using camels in the American west. Remnant of an early corral at the Parade Grounds on the north pass? There are many petroglyphs around the Saline area, some known, many not known. Aside from indicating early habitation by nomadic people, some areas give evidence of early settler traffic through the region. In the canyon of Marble Bath (the historic Marble Bath, not the recently constructed bathtub) on Steele Pass, in addition to older petroglyphs, up-canyon there is a list of names carved into the wall dated 1898 from Greencastle, Indiana. This site was apparently a source of relief for this party, and may have been a known opportunity, as they carved the word “WARTER” into the wall with an arrow pointing below to a natural tank that held water. Anytime I have been in the canyon this natural tank has been filled with dirt from flash floods, but dig into it, and you will find moisture if not water. 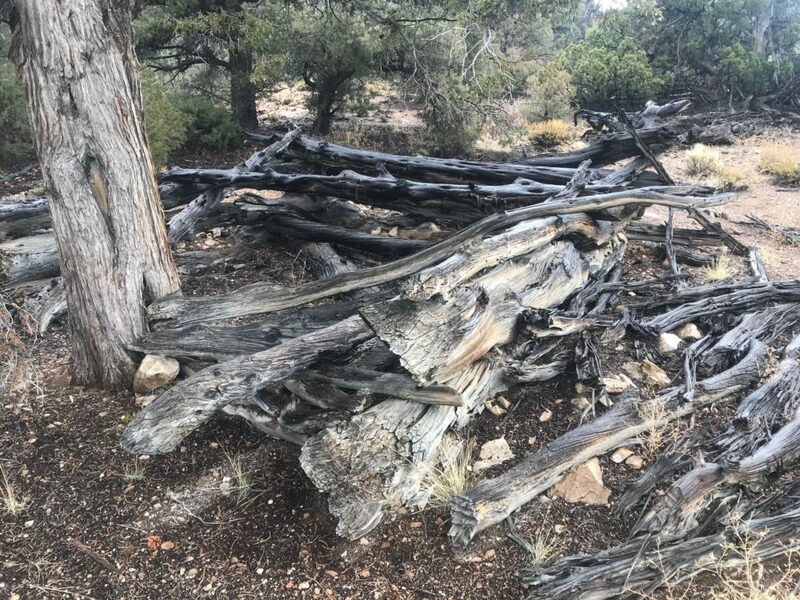 I was recently speaking of this location with a local miner who told me that he and friends took their horses into the canyon and spent close to a week camped in that location as they prospected. Digging down into the gravel of the tank, they had sufficient water for the horses, and it seemed to issue from a small seep inside the tank. 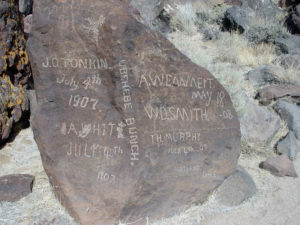 On Lee Flats, in an area rich with petroglyphs when a spring issued from the volcanics, there is a similar list of names of men who identified themselves as the Ubehebe Bunch dated at the turn of the century. Throughout much of the 20th century, prospectors and miners have frequented and populated the valley in search of its mineral wealth, including gold, silver, tungsten, mercury, talc, lead and salt. Mines such as the Metro Cent, Inyo Queen, White Eagle, Grey Eagle, Snowflake, Beveridge, Keynot, Cerro Albino and others were relatively minor players in comparison to larger neighboring operations including Lippincott and Cerro Gordo. The mining of salt from the Saline Valley lake brought electricity into the valley (10,000 volts tamed in step-down transformers to run the motors that hauled salt over the highest tram in the country failed to ever produce a profit) and evidence of a moderate population in the valley can be found in and around Hunter Canyon. When I first started visiting Saline Valley large trucks regularly ran in and out of the valley along the county road hauling pharmaceutical-grade talc from the mill site of Willow Creek. During the 60’s Saline Valley started hosting a new style of community. People who were not comfortable within the mainstream of contemporary societal values found a freedom within the relative isolation of the basin. Folks settled in and around Hunter Canyon, Badwater, Beveridge Canyon, Willow Creek, Morning Sun, the Seven Sisters, Pat Keyes, McElvoy as well as the warm springs. These may have been refugees from foreign wars, or just refugees from convention. Some were refugees from the law which is how the style of giving people “handles” began. As Turtle Jim pointed out to me early on, “we don’t use last names around here … folks are wanted by the law.” I thought he was joking at the time, but recent conversations with old-timers from the way-back-when suggest there was more truth to this statement than I had realized. As one veteran of the Valley put it: “It was the first time in years I did not feel I needed to carry a gun.” (Make no mistake, there were plenty of guns around, and quite a bit more gunplay back in the day … it was the wild west and anarchy was the order of the day for those seeking this kind of freedom). Many came and discovered they no longer had to continually look over their shoulder. Quite a few have told me it was the first time they had discovered a sense of family and belonging. The community and family that these early residents discovered is still strong to this day, though they are scattered by miles, they are close in heart. Word spread locally of the magic to be found in the silence and solitude and waters of this oasis for the body and soul. A more genteel crowd began to filter in from nearby communities, and the wild west began to take on a resemblance of a better behaved and more civilized community. Some of the wild bunch began to scatter as the “flat-landers” started to arrive, and the nature of the community began to shift slightly. I concede I am one of the new-comers that saw a shift in the nature of the place (my first appearance was in April 1980). The basic magic of the “community” was still easy to see, and it was still the bohemian that found their way down the tortuous trails to find rest and companionship among like-minded souls beneath skies that held more stars than any of us had ever seen. The romance of a campfire under western skies with a guitar serenading the night and soul landed many of us to the creel of a family transcending relatives. We redefined “relations.” People who were relegated to being wall-flowers in the world found themselves to be stars among their new relations. Through the decades of sharing secrets, word of mouth, the internet, and the designation as a National Park, the valley has come under the weight of a crush of newcomers. The majority of early communities and family members have long since refrained from visiting Saline Valley any more, though the ties born of the Valley’s magic keep many of us in close proximity to each other. From my point of view and perspective, camping limitations imposed by the NPS has served to undermine the community that has helped to develop and maintain this “people’s park” over more than half a century. I hope this is no more than the traditional curmudgeon’s perception of change, and that those new members of the community who recognize the magic of the silence and serenity forge the new families and communities of Saline Valley’s future. Enjoyed reading your writing once more Tom. Appreciate you writing about Saline Valley. Tom has eloquently stated what I have learned over my time in the Saline. The valley may wreck your truck but if you are worthy it will fulfill your dreams. A great summation Chris. I am going to incorporate that into the larger project, and quote you. Thanks! Thank You! You have articulated what I have been unable to explain to my family and friends. The beauty, silence and rewards of a journey into a place less traveled. Much has changed in the valley since I lived there. Beverage Canyon was my home for just over four years. Made many friends. Only still in touch with one. Wish I could see the place again sometime, but not sure if I ever will. Some of the best times of my life were there. I miss it. Excellent piece of history. Eloquent & lovingly penned. Thanks. Saline has inspired me to many things, including the recent homage: Perhaps what we hold most in awe about Nature is its majestic indifference to humanity. In the 70’s Saline Valley was my home. I was one of the miners that lived at Willow Creek. I miss the valley! Great to hear from you Mike. I remember the talc trucks coming and going and you guys keeping the road in good shape. Sometimes you even came up the road to camp and graded that road. I have memories of you and your mom and dad sitting around the campfire listening to Johnny Tequila roast campers and sing about Pancho and Lefty. One Fourth of July I rode my Yamaha over the Willow Creek to celebrate Independence day with you all and we enjoyed a great night of bottle rockets, firecrackers, dynamite and prell. I think somebody lost the windshield of their truck down by the gate as rocks rained about us bouncing off the metal roofs of the cabins. Good times!